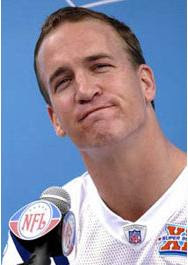 Ravens Need to Move on from "Patriot-gate," Focus on "Manning-Face"
Alright. Enough is enough. The dead horse that is the ref’s calls, Bart Scott’s tantrum, the ill-advised time-out, and the kiss-blowing head coach has officially taken all the kicking it can stand. The most painful loss in recent Ravens history is in the rear view mirror, which is at least better than it being in front of us, right? Yeah, I don’t really know what that means either, but work with me here. Move on. You can bet every penny in your pocket that from the moment he took his final kneel-down last Sunday to preserve the 28-25 victory over the Jacksonville Jaguars, Peyton Manning has thought about nothing but purple. He had a 1.5 day head start on the Ravens to begin with, and every minute they spend wallowing on Monday night’s debacle just tips the scales further in the unicorns’ favor. While Samari Rolle is talking to his agent about how he feels disrespected by the referees, Manning is looking at film of where to throw so Samari can’t get to the ball. While Bart Scott is on ESPN talking about how he is sorry for his inexcusable tirade, Manning is watching for subtle differences in Scott’s pre-snap stance depending on whether he is blitzing or dropping into coverage. The best way to leave last Monday in the past will be to beat the Colts this week. Every second the Ravens waste dwelling on the past just makes that goal less and less attainable. This entry was posted on March 14, 2008 at 12:23 pm and is filed under Ravens. You can follow any responses to this entry through the RSS 2.0 feed. You can leave a response, or trackback from your own site.